The Creator has a Name, few know it; yet, they wonder why their prayers are not answered today. The Creator’s Name was hidden; some say because of superstition, others say because those who caused His Name to be forgotten hated Yahweh and Righteousness. The rejection of Yahweh and Righteousness is what the Scriptures show. The Scriptures also show the many benefits they cast aside with this evil action. Yahweh’s Prophet Micahyah shows these evil men hated Righteousness. Yahweh’s Prophet Samuyl shows the same evil connected to the God worship of Egypt. Those elders of Israyl were the children of the twelve tribes whom Yahweh brought out of Egypt just 379 years earlier. They never repented of their God worship. They called themselves Coptic Catholics. Coptic means Egyptian. Catholic means universal worship of all Gods. Read the history of the children of those God worshippers in your Bible or even better, in The Book of Yahweh. Verse 40 shows they asked to be made Gods. The Roman Catholic Church and the Coptic Catholic Church deify certain ones who die as Gods. They, then, keep memorials to those dead Gods, as if they had power to answer prayers. They do not. They are dead. They have no power at all. They are dead (verse 4) so they have no power to save or destroy, but the people are deceived into thinking that Gods or Lords can answer prayer. Some of those Gods were the evil ones who persecuted Yahweh’s Prophets and refused to keep Yahweh’s Laws. Read it for yourself and believe what you read. Verse 52 shows they called themselves Pharisees, Sadducees, Essenes, and Herodians during the time of the Disciples of Yahshua. The Pharisees, Sadducees, Essenes, and Herodians were the betrayers and murderers of Yahshua, as shown in Mattithyah, Yahchanan Mark, Luke, and Yahchanan. 2 Now Yahdah, who betrayed Him, also knew the place; for Yahshua had often gone there with His disciples. 3 Then Yahdah, guiding a band of soldiers and officers from the chief priests and Pharisees, came there with lanterns, torches, and weapons. Genesis 3:5: evil as the Gods they worship. Just as they have done to Me from the day I brought them out of Egypt, to this very day, they are now doing to you__they are forsaking Me in order to serve God(s); Elohim! They—Pharisees, Sadducees, Essenes, and Herodians—were the Coptic Catholics. They are in Rome today and are known as the Roman Catholics. They are the same religion shown by Yahweh’s Prophet Micahyah. 3 Who also eat the meat of My People, who strip off their skin, break their bones, and chop them into pieces, as meat for the pot, as flesh within the caldron. Verse 7 shows they are diviners. So the seers will be ashamed, and the diviners confounded; yes, they will all shut their mouths, for there is no answer from Yahweh. Her heads judge for reward and her priests teach for pay, and her prophets divine for money. Yet they lean upon Yahweh, and say; Is not Yahweh among us? No evil can come upon us! The word Vatican, the city that houses the Roman Catholic Church, means just that. From a Google search under “Vatican meaning”, we found the word “Vatican” literally means “Divining Serpent,” and is derived from Vatis = Diviner and Can = Serpent. Vatican City and St. Peter’s Basilica were built on the ancient pagan site called in Latin vaticanus mons or vaticanus collis, which means hill or mountain of prophecy. And the great dragon was cast out, that old serpent, called the devil and Satan, who deceives the whole world. She was cast out into the earth, and her angels were cast out with her. In 70 AY (After Yahshua), they made their move to Rome and had their Roman army destroy Yerusalem and murder those who came to Yerusalem to celebrate the Feast of Yahweh. By 70 A.D. (AY), Jerusalem and Judea were left desolate, most of the people either killed or being held in captivity, or had become refugees fleeing to remote lands (even the lands now called America). All that remained in Israel was the defiant little garrison atop the mount at Masada, a fortress complex south of the Dead Sea, which was built by Herod the Great. Thus when the (House of Yahweh) was (removed–taken down as Yahshua said) in A.D. (A.Y.) 70 the period of the second exile began. The Victory Arch of Titus commemorates Titus’ victorious conquest of Judaea, leading the sacking of Jerusalem and ending the Jewish wars. The arch was constructed after Titus’s death in 81 c.e. (A.Y.) after his becoming a god. The Arch of Titus is located on the highest point of the Via Sacra, a road leading to the Roman Forum. This is a single arch, 15.4m high, 13.5m wide, and 4.75m deep. The marble reliefs stand nearly 2.5m in height. On the Arch of Titus is a relief depicting the Romans’ triumphal procession, returning with spoils from the (House of Yahweh) in Jerusalem. Especially prominent is the sacred Menorah, but we can also see the Table of the Shewbread, and the silver trumpets which called Jews to Rosh Hashanah. Now read the Prophecy of this evil that was done by the Roman Catholic Church in 70 AY when they called themselves Pharisees, Sadducees, Essenes, and Herodians. This Prophecy was made in 710 BY (Before Yahshua) by Yahweh’s Prophet Micahyah when the Roman Catholics called themselves the heads of Yahaqob. 11 Her heads judge for reward and her priests teach for pay, and her prophets divine for money. Yet they lean upon Yahweh, and say; Is not Yahweh among us? No evil can come upon us! In his book The Land and the Book, Dr. William Thomson wore, “Mount Zion is now [in the eighteenth century], for the most part, a rough field. From the tomb of David I passed on through the fields of ripe grain. It is the only part of Jerusalem that is now or ever has been plowed.” When Sultan Suleiman the Magnificent rebuilt the walls of Jerusalem in A.D. 1542, the architect omitted Mount Zion, the City of David, from the area he enclosed, and strangely enough it was only partly built up again. How, except by divine inspiration, could Micah have foretold that this particular part of Jerusalem would be “plowed like a field”? 2 But Yahshua said to them: Do you see all these things? Truly I say to you: There will not be one stone left sitting on top of another, which will not be thrown down. The Temple was dismantled and moved to Rome. It’s now called the Sistine Chapel, and the pope has taken his seat in that temple. The Vatican’s Sistine Chapel, perhaps the most famous Catholic prayer sanctuary in the world, has a deep, hidden connection to the Jewish faith: it shares features and measurements with King Solomon’s Temple in Jerusalem as described in the Bible. Hosting millions of visitors every year, it seems incredible that this very Christian edifice could be modeled after the Jewish Temple. The astounding similarities are revealed in The Sistine Secrets, a fascinating book by Vatican tour guide Roy Doliner and Rabbi Benjamin Blech. Located in the Apostolic Palace, the official residence of the Pope, in Vatican City, the Sistine Chapel is named for Pope Sixtus IV, who had it built between 1477 and 1480. The Chapel is renowned for the incredible frescos that decorate its interior, including Michelangelo’s The Last Judgment. Pope Sixtus IV spent vast amounts of the Vatican’s money on reviving the splendors of Rome, rebuilding churches, and founding the Vatican library. But his most famous project of all was the reconstruction of the Palatine Chapel, which he renamed the Sistine Chapel after himself. The new plan of the Sistine Chapel was more than just a renovation, however; the pope took the opportunity to incorporate Jewish elements of Temple worship as he rebuilt. 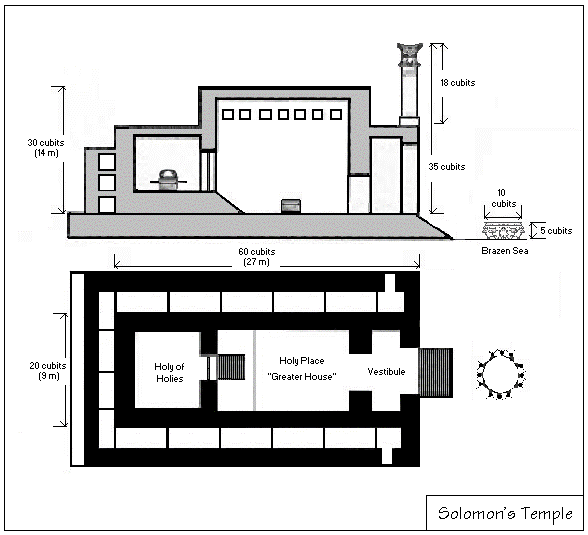 Several aspects of the Chapel’s new measurements and design matched those of the first Holy Temple completed by King Solomon – exactly. As detailed in the Book of Kings, the measurements of the Heichal, the inner sanctuary of the Temple, are 40.9 meters (134 ft) long, by 13.4 meters (44 ft) wide and 20.7 meters (68 ft) high. These are the exact dimensions of the Sistine Chapel. Another feature matching that of the Jewish Temple is the double level construction. The Western half of the Sistine Chapel, containing the altar and the private area for the Pope and his court, is some six inches higher than the Eastern half. This elevated section corresponds to the Jewish Temple’s Kodesh HaKodashim, the Holy of the Holies, where only the High Priest could enter, only once a year, on Yom Kippur, the Day of Atonement. In the Jewish Temple, the Paroket was the curtain separating the rest of the Temple from the Holy of Holies. Correspondingly, the Sistine Chapel features a huge white marble partition grill in a parallel location with seven marble flames on top, mirroring to the seven-branched menorah (which ancient legend suggests is hidden in the Vatican today), or candelabra, that glorified the Jewish sanctuary in Biblical times. According to Rabbi Blech, the changes were motivated by a desire to co-opt Jewish concepts. “The motive for basing elements of the Sistine Chapel on Solomon’s Temple is the Replacement Theory. “They believe they are the true descendants of Abraham, Isaac and Jacob and that after Jesus, God rejected the Jews and chose them. 2 That you not be soon shaken in mind, nor be troubled, neither by spirit, nor by word, nor by letter as if from us, as that the day of Yahweh is at hand. 4 Who is an adversary, and exalts himself above all, declaring himself a God (el), and he is to be worshiped; so that he, as a God (el), sits in the temple of God (beth-el), showing himself to be a God (el). 5 Do you not remember that when I was still with you, I told you these things? 6 And now you know what is restraining him, so that he may be revealed in his time. 7 For the mystery of iniquity is already working, but the One restraining him will continue to restrain him, until he is made to appear in the midst. 10 And with all deceivableness of sin in those who are perishing, because they did not receive the love of the Truth, that they might be saved. Remember, Yahshua is speaking of building The House of Yahweh in the Last Days, or nuclear generation, when mankind’s bombs can darken the sun. Here Yahshua is speaking of the Seventh Work of Yahweh shown with the Seven Lamp Lampstand. And He will send His malakim with a great sound of a trumpet, and they will gather together His Elect from the four winds, from one end of earth to the other. I, Yahshua, have sent My Messenger to testify to you these things in the congregations of The House of Yahweh. I am the Root and the Offspring of David, and the Bright and Morning Star. If you can absorb three more Scriptures, you will understand that one of Yahweh’s Two Witnesses is writing you this letter. 2 This is what Yahweh says, Who made you and formed you from the womb, Who will help you: Do not be afraid, Yahaqob My Servant and Yeshurun; Beloved Yisrayl, whom I have appointed. 5 One will say; I belong to Yahweh, and the same will call himself with the name of Yahaqob. The other will subscribe with his hand, and write; I belong to Yahweh, and surname himself with the name of Yisrayl. 6 This is what Yahweh, the King of Israyl, and Redeemer, Yahweh our Father, says: I am the First, and I am the Last, and except for Me there is no source of power! 8 Do not fear, nor be afraid. Have I not told you from that time, and have declared; You are My Witnesses! Is there a source of power except Me? Truly, there is no other Rock; I know not one. Notice, two brothers called Yahweh’s Witnesses. 2 But the court which is outside the Temple leave out, and measure it not; for it is given to the nations. And the holy city they will tread under foot three and one-half years. 4 These are the two Olive Trees, and the Two Lamps of the Seven Lamp Lampstand, ministering for the Father in the earth. Notice, Two Witnesses called two Olive Trees and two Lamps of the Seven Lamp Lampstand. 3 And there are two Olive Trees by it, one upon the right side of the bowl, and the other upon the left side of it. Notice the Two Witnesses, two Lamps (Rev. 11:3), two Olive Trees called Branches. 9 Then I lifted up my eyes and looked, and behold: Two women; The Last Two Eras of The House of Yahweh, sent with commandment. The Spirit of Yahweh came to overspread them; and they were covered with the covering of saints. And they exalted, magnified, and extolled the ephah; The Standard of Perfection, which is sent by Yahweh’s Laws, separating the way of the world from The Way of Yahweh. 11 And he said to me: To build The House of Yahweh according to The Standard of Perfection sent by Yahweh’s Laws, in a Babylonish land which does not yet exist. And it will be established at that time; when The Two Witnesses are called out to their work; as the Established Place; the Habitation of Yahweh; THE HOUSE OF YAHWEH. That Prophecy was written in 519 BY (Before Yahshua). The only land not established (verse 11) or discovered at that time was America. History states it was discovered in 1492; that was 2011 years after the Prophecy in Zecharyah was written. So Yahweh’s Warning was prophesied to be sent to all the world from a land that would be called the United States of America. By who? By one of the Branches (House of Yahweh) prophesied to be established, with a High Priest named Yahshua, in the chief nation—the United States of America. 11 Take the silver and gold and make crowns, and set them upon the head of Yahshua son of Yahweh, the High Priest. 13 Yes, He will build The House of Yahweh. He will bear glory, and will sit and rule on His throne. He will be a Priest upon His throne; and the counsel of Peace will be between them both. Verse 11: the word Yahzadak, translated Josedech in the King James Version, is actually the Creator Yahweh. Yahzadak is word #3087 from #3068 in the Hebrew dictionary of Strongest Strong’s Exhaustive Concordance. 3 I will give to you the treasures of darkness and the riches of secret places, so you may know that I, Yahweh, Who calls you by name, am the Father of Yisrayl. 4 For Yahaqob My servant’s sake, and Yisrayl My chosen; and I call you by your name (Yahaqob); and I surname you (Yisrayl), though you did not recognize that it was Me. 6 So that they may know from the rising of the sun to the place of its setting that there is none besides Me. I am Yahweh, and there is no other! 18 For this is what Yahweh, Who created the heavens, Who is the Father, Who formed the earth and made it, Who has established it, Who did not create it in vain, Who formed it to be inhabited, says: I am Yahweh, and there is no other source of power! 19 I have not spoken in secret, in a dark place of the earth; I did not say to the seed of Yahaqob: Seek Me in vain. I, Yahweh, speak Righteousness! I openly speak things that are Right! Now get this: Yahweh is the Only Being Who can give Life. Yahweh does not force Eternal Life on anyone. The Scriptural fact is, mankind must choose. In the beginning, mankind cut themselves off from Yahweh and Life. Read it and believe it. Mankind chose to obey Satan, be evil as the Gods, and to practice sin. 6 So when the woman saw that the tree was desirable for food, that it was pleasant to the eyes, and a tree desirable to make one wise, she took of its fruit and ate. She also gave to her husband with her, and he ate. Did you see verse 5 – as Gods, evil? Again, the leaders chose death by sin. Verse 8: in order to be as God – evil. 19 Now this is the condemnation: Light has come into the world, but men love darkness rather than Light, because their deeds are evil. 20 For every one who practices evil hates the Light, and neither comes to the Light for fear his deeds would be exposed. 21 But he who practices Truth comes to the Light, so that it may be plainly seen that his deeds have been done through Yahweh. Did you notice in verse 20, those who practice evil? In this generation there are 4,199 religions, and they all reject the Ten Commandments of Yahweh. They pray to Gods and Lords. They practice sin; yet, they claim they will receive Life Eternal. But the only authority – the Bible or The Book of Yahweh, from which all versions come – says there is no Salvation in the practices of those 4,199 God worshipping religions. In Scriptural fact, they belong to Satan. Genesis 3:5: evil as the Gods. Remember: cut off from Yahweh because they practice evil as the Gods. When you pray to Lord, you pray to dead rabbis. The religious leaders cause the people to forget the Name Yahweh for Lord, even though they are well aware of the Creator’s Name; yet, purposely misspell it. The following article is from Sky News. VATICAN CITY – Speaking before a delegation of Jewish leaders at the Vatican on Thursday, Pope Francis revealed he has instructed the Vatican Secret Archives to unseal a set of ancient scrolls that have been kept hidden from public knowledge for centuries by the Church. The scrolls, which were encased in marble and buried in 463 A.D., are said to contain the true name of God as communicated to Moses in the Book of Exodus. The Pope told an audience during an event celebrating a new version of the Torah that his decision to upend over fifteen hundred years of secrecy was driven in part by a need for “greater transparency” within the Catholic Church. “It is a scandal to say one thing and do another,” declared Pope Francis before adding that the Church is “leading a double life” by continuing to keep God’s name secret. As to why the Catholic Church has gone to such great lengths to keep [the Creator’s] true name a secret remains unknown. What is clear is that the Papacy has maintained an unbroken chain of communication in regards to the matter dating back to 468 A.D. “In keeping with tradition, each successive Pope since Hilarius has been made aware of the Lord’s name,” Vatican spokesman Greg Burke confirmed on Friday. The Vatican Press Office has received more than two million inquiries regarding God’s (the Creator’s) name since the Pope’s announcement on Thursday. “Our phones have been ringing off the hook,” said one Vatican insider who spoke to BBC News on condition of anonymity. “Understandably, everyone wants to know [His] name,” the insider said. The word Lord was invented by the rabbis for their teachers. The bible dictionaries say that the word Lord should not have been used to replace the Name of the Creator, Yahweh, in the versions such as the King James Version. There are presently 4,199 religions teaching the world to worship Gods. I Yahchanan 3:4-11: not practicing Yahweh’s Laws of Righteousness is evil as the Gods. Remember: the love for evil is what condemns the 4,199 religions today, and from the beginning. 11 And such were some of you. But now you are washed, now you are sanctified, now you are justified in the Name of Yahshua Messiah, and by the Spirit of our Father. The last Book in your Bible says the whole world is deceived. They’re cut off from Yahweh, the Creator, and Life that only Yahweh offers. Genesis 3:22: love for evil condemned them. Yahchanan 3:19-20: whole world deceived. They speak evil as the Gods (Gen. 3:5); all have gone the way of Cain (Yahdah 1:11). That House of Yahweh has Yahshua Messiah as High Priest. Then I will encamp around My House like a Guard, against those who march in and out. No more will an oppressor overrun them, for now My eyes are watching over them. Then you will gather here at The House of Yahweh.